Every day the children come for a noon meal a Bible lesson is presented. 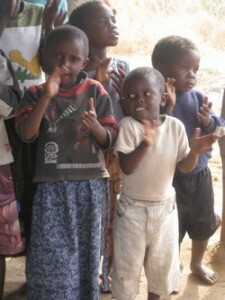 The children also sing Bible songs. The meal is not contingent upon what faith they have. No child will be turned away from a meal. 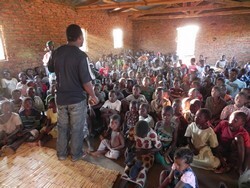 When possible, people from churches in Lilongwe, Malawi, come to KOCM for an evangelism night. They bring drums, a keyboard, guitars and a generator so they can sing and dance while people gather. Later they have a Bible lesson or show the Jesus film, a two-hour docu-drama about the life of Christ based on the Gospel of Luke. The Jesus film is in the Malawian language of Chichewa. About 350 people have sat on the floor of the meeting hall, a 35’ x 60’ space, to watch this film.